Let’s not make the mistake of turning those beautiful, rich colors and patterns we are a part-of into a jumble of pastels or shades of grey. 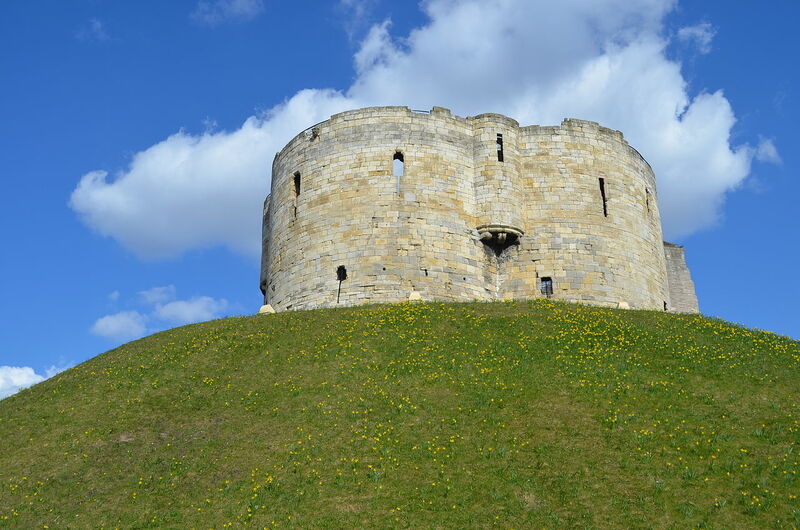 First, I remembered an episode from my journeys as a student in England in 1983: One day, on a whim, I visited a tower built on a high mound just outside the walls of the city of York. Now known as Clifford’s Tower, it stands on the site of a massacre that occurred in March 1190, when most of the Jews in York took refuge there, seeking to escape the riots that had erupted against many “outsider” groups as “Crusade Fever” swept through Western Europe. I read a description at the site of what was found after the riots had ended: the tower’s courtyard was littered with corpses. Surrounded and without hope of escape, the families had lain down together in the courtyard. The fathers then killed their own children and wives before setting fire to the fortress and committing suicide beside the bodies of their loved ones; a very Masada-like scene. Those who survived were later massacred by the mob that surrounded the burning tower. I reflected that many of my ancestors came from Northern England. Therefore, it is possible, if not likely, that some of my own forebears were in that mob. Yet, my family does not preserve any stories of that time or those events. (Similarly, whites in the south are often unaware of the brutality their ancestors inflicted upon African American slaves.) History likes to remember and celebrate the times when we were brave or victorious; but tends to forget the times when we were cruel, avaricious, or oppressive. Second, I was struck by how everyone in the Operetta was seeking to do the best they could, despite the fear, loss and pain they were experiencing. They realized their actions were wrong only after the fact, when it was too late to repair the damage. The two lead characters in this production were in exactly the same positions as “that teenage girl” and me: she lashed out in fear and anger because of what I represented to her, not because of what I’d done. I learned from this that I may never fully understand what it means to be the target of discrimination. I can empathize, I can work to promote understanding, but I am limited in what I can achieve because I am not a member (at least, not yet) of a group that experiences such things every day. Does this mean I should ignore that discrimination and prejudice exist? No. Should I wallow in guilt and remorse because of my own past actions, or those of my ancestors? No. Should I try and remold myself so that I will never offend or oppress another person in such ways? No! I’ve come to believe, as a speaker said after the performance, that we need to respect and celebrate our differences. Our differences make the world a place of vibrant colors. Let’s not make the mistake of turning those beautiful, rich colors and patterns we are a part-of into a jumble of pastels or shades of grey. Text is copyright (c) 2009, Allen Vander Meulen III, all rights reserved. I’m happy to share my writings with you, as long as you are not seeking (or getting) financial benefit for doing so, and as long as proper credit for my authorship is given (via a credit that mentions my name or provides a link back to this site). Our Faith is a language: the language we use to explain and explore our relationship with the Eternal. What’s both wonderful and annoying about being a Divinity Student is that you are always thinking: thinking about the next paper, this morning’s lecture, conversations in the cafeteria, email exchanges with friends, etc. It is a constant learning experience, both inside the classroom, and outside. You are (or at least I am) always ruminating upon the implications of the things we are learning. I am always seeking to tie my latest revelations into that tapestry that is the sum of what I’ve learned to date in the long and rather meandering path I’ve taken through life. I also love to write and to discuss these thoughts with others. So, voila, time for a blog. My viewpoint from a pastoral / theological point of view is this: that our faith is for each of us like a language. It is a language that helps us explore and express our relationship with the eternal. Everyone has such a language, whether we are a Christian, Jew, Buddhist, Atheist, Shamanist or we (as our Australian Aboriginal cousins do) walk in the Dreaming. Our Faith is a language: the language we use to explain and explore our relationship with the Eternal. A major interest of mine has always been to learn more about our own “eternal language” and those of others. The “eternal language” I use to explore my own relationship with the eternal, with God if you will, is Christianity. That I am a Christian is in large part due to the confluence of my origins as a child born and raised in the Reformed Protestant tradition, my deep familial roots in New England, my education, and the choices I’ve made in life up to this point. Christianity works for me. I am familiar with it. It is part of the “cultural wallpaper” of my life, and I find that the concepts it embraces and expresses are excellent and familiar tools as I explore and learn more about my relationship with God. This does not mean that I feel Christianity is the right “eternal language” for everyone, or even anyone, else. When meeting speakers of languages like German, Spanish, Tagalog or Warlpiri, we do not condemn such people for not speaking English. (At least, I do not!) We (hopefully) recognize that their language is an integral part of who they are, how they view the world, and how they relate to the culture in which they were born and (probably) still live. Their language helps define who they are and their place in this everyday world we both share. Similarly, one’s faith defines one’s understanding of who we are and where we stand in relationship to the issues of eternity. Faith answers questions like “Why are we here?” and “Where do we go when we die?” Faith is the language we use to explore the eternal world, it also shapes our view of that eternal world, shapes our relationship with it, and is how we communicate our views on such issues when talking with others about them. Therefore, every Faith has value. Every one provides a viewpoint on issues of eternity – a viewpoint that can be a new perspective that helps us more fully understand both our own faith and how we relate to eternity. So, I am always looking to learn about the faiths of others, so that I can more fully appreciate where they stand, and because I find that learning more about their faiths enriches my understanding and appreciation of my own. Our faiths are the sum of the millenias-old legacy of thought and belief that has been passed down to us. What I find both interesting and distressing about this is how so many of us (including myself) are often ignorant of that legacy. In that ignorance, we often do not think-through the implications of what we believe, whether the reasons for a particular belief we have has relevance any more, or how our beliefs impact, or are viewed-by, others. My goal in this blog is to explore Faith both in the general and in the particular: exploring my own views on Christianity and how it relates to my day to day experiences in this world, and reaching across the boundaries to explore the faiths of others. I also hope to help both myself (and you) better understand other faiths and how their understanding of the eternal can shed light on our own understanding. This blog is therefore an exploration and a learning experience. I am glad that you have taken the time to journey on at least part of this path with me, hope you’ll share your own thoughts as we go along.